Does Google Have a Gender Pay Gap? On Friday, the Department of Labor announced it had been investigating Google for paying women employees less than men. Google has disputed the allegations. But because this news made headlines around the world and Glassdoor sits on a massive salary database comprised of millions of salary reports shared directly from employees themselves, we asked the question: Does Google have a gender pay gap problem? While the federal government didn’t disclose how it concluded that Google pays women employees differently from men, Glassdoor is uniquely positioned with thousands of salary reports from Google employees to shed some additional light on this issue. Below, I’ll show how we find no statistical gender pay gap in Google salaries, at least according to Google’s pay data shared by employees on Glassdoor. While pay gaps can be analyzed in a variety of ways, we believe the most thorough way to do so is to control for important variables that allow apples-to-apples comparisons. We outline this below. As the chief economist at Glassdoor, I published an “employer’s guide” this month, with example code and data, that lays out a step-by-step process for how companies can perform their own gender pay audit. Our guide uses the same econometric methods you’ll find in academic journals in labor economics. It’s the way most expert economists — including economists at the Department of Labor — would almost always analyze payroll data for a gender pay gap. We’ve published a major study showing how to apply this methodology more broadly, and even applied it to Glassdoor’s own company payroll data. If there’s really a gender pay gap at Google, this method is how to correctly document it. We looked only at workers who reported base pay between $30,000 and $250,000 per year (to exclude outliers). Below is a table summarizing our sample data. There are 1,967 Google salaries. The salaries are 78 percent male — Google’s own self-reported data show the company is about 69 percent male — and the average age of employees is 34. About 54 percent have bachelor’s degrees, 33 percent have master’s degrees, and 5 percent have Ph.Ds. The average years of experience for these workers is 5.8 years. In this analysis, we only looked at base pay as reported on Glassdoor’s salary survey. That’s because we wanted to use our most reliable data. We don’t examine total compensation — which would include bonuses, tips, equity, commissions and other forms of pay — because many people don’t report them correctly or consistently. Source: Glassdoor Economic Research (glassdoor.com/research) based on U.S. salaries for Google on Glassdoor as of April 10, 2017. To analyze Google’s gender pay gap, we applied the same methodology from our guide. As we explain there, it can be misleading to simply compare male salaries as a group to female salaries as a group. Men and women often work in different roles and have different types of education and experience. Those things affect pay in the labor market, and have little to do with gender bias in compensation policies by any single employer. To correctly analyze the gender pay gap you need to use regression analysis to control for observable differences between men and women, to see whether there’s really a pay gap once you’ve made an “apples-to-apples” comparison of men and women working in similar jobs, in similar locations, with similar education, performance and experience. Below are our results. The gender pay gap in Google salaries is shown in the first row of the table. It shows the percentage pay advantage for male employees compared to females, both before and after adding statistical controls to compare similar workers. In the first column, we find an “unadjusted” pay gap — which is equivalent to average pay for men as a group compared to women as a group — of 16.3 percent. Adding controls for education, age and years of experience, in the second column we see the gender pay gap shrinks to 13.1 percent. 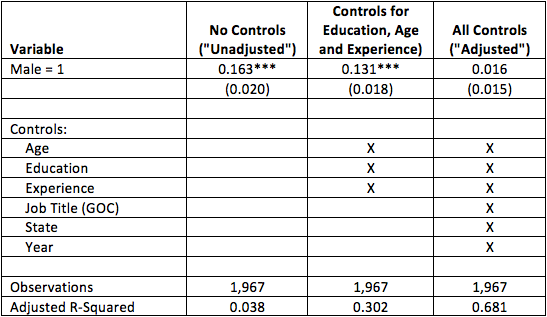 Finally, in the third column we add all statistical controls for year of the salary report, state of employment, and job title to assure we’re comparing men and women working in similar roles. This is what we call the “adjusted” gender pay gap. In that column, we see the pay gap shrinks to 1.6 percent — and is not statistically significantly different from zero. Once we make an apples-to-apples comparison of male and female workers at Google, it turns out that there’s no statistical evidence of a systematic gender pay gap — at least not in the Google salaries employees have shared on Glassdoor. The Department of Labor hasn’t shared their data or methodology showing how they came to the conclusion that Google has a gender pay problem. In this post, we show that men on average do earn about 16.3 percent more than women at Google. But that’s not a complete or fair comparison, as it compares software engineers and marketing associates as if they’re in the same pay bracket. Instead, when we make an apples-to-apples comparison of workers with similar jobs and backgrounds, that 16.3 percent gender pay gap largely disappears. We find an “adjusted” gender pay gap at Google of about 1.6 percent, which is not statistically significantly different from zero. Put differently, there’s no evidence in salaries on Glassdoor of a systematic gender pay gap at Google. (This post originally appeared at glassdoor.com/research).